5G takes its second wind towards the full global 5G standard, the commitment of the Verticals, and convincing demos by 5G PPP. The Winter Olympics and MWC’18 will likely see flourishing 5G trials and a number of interesting announcements. 2017 was very busy for both 5G PPP Phase 1 and Phase 2 projects. Some of the notable achievements include PoCs (Flex5Gware, Fantastic-5G, 5G-Crosshaul, 5G-Ex, Speed-5G, Coherent), METIS-II Visualisation Platform, 5G-ENSURE consultation on 5G security. 5GPPP Phase 2 projects leverage knowledge from various 5G PPP phase 1 projects including: SESAME for 5G ESSENCE, 5G-NORMA and METIS-II for 5G MoNArch, SONATA for 5G TANGO, COgNet, SELFNET and5GEx for SLICENET, Flex5GWare for MATILDA, 5G-XCast 5GCITY, 5G MEDIA and 5G TANGO,5G-ENSURE and CHARISMA for NRG-5, Superfluidity, VirtuWind, SONATA and SESAME for NGPaaS…. Flex5Gware, Fantastic-5G, 5G-Crosshaul, 5G-Ex, Speed-5G, Coherent demonstrated several PoCs at Turin TIM premises in June 2017. A visual proof of the demonstration event is available here. In METIS-II, one of the key objectives was to enable the 5G concepts to reach and convince decision makers from non-ICT industries. Thus, it was necessary to have easy-to-understand illustrations of the envisioned 5G use cases and the proposed technical solutions, targeting the non-experts. 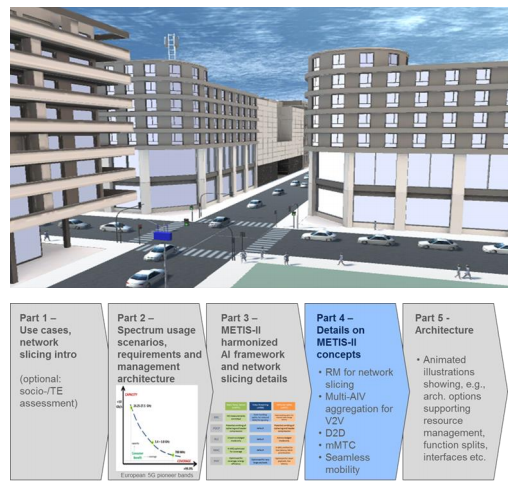 A professional 3D visualization tool (METIS II Visualization Platform) enabling a viewer to interact with 5G enabled scenarios was introduced by METIS-II to achieve this and to allow the introduction of simulation driven data to be evaluated. Slice-specific RAN (Option 1), Slice-specific radio bearer (Option 2), Slice-aware shared RAN (Option 3). • Option 2: Slice-specific radio bearer. The second option refers to sharing transmission point (cell) specific and user specific functionality, i.e., PHY and MAC in the data layer, and RRC in the control layer. This options slightly reduces the complexity because resource multiplexing would be implemented across all network slices and each network slice makes use of the same efficient flexible RAN implementation; on the other hand, each network slice may still customize the operation through configuration and parameterization based on the service requirements and each network slice may still implement its own QoS control (QoS prioritization). Hence, this option provides a reasonable trade-off of flexibility and complexity. 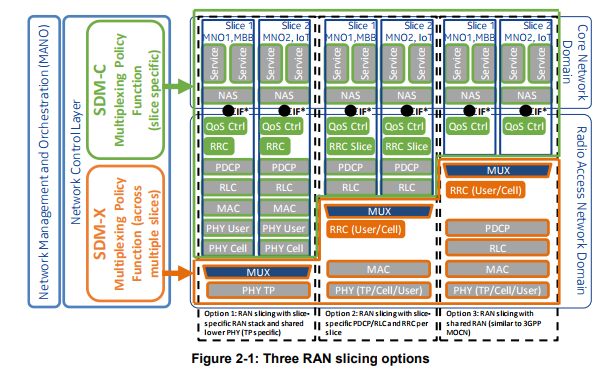 • Option 3: Slice-aware shared RAN. The third option in Figure 2-1 refers to a deployment where the complete RAN is shared by multiple tenants. This option is close to existing solutions such as eDECOR although in our case, multi-slice connectivity is considered. Hence, one UE may be connected to more than one network slice. In addition, the SMDC Coordinator is quite powerful in this option because a significant part of the RAN functionality may be implemented as applications on top of the SDM-X. 5G-ENSURE is driving a vision for 5G Security right from the first phase of the 5G PPP to identify challenges and priorities for security and privacy in Europe and beyond. Two open consultations have been published, one in 2016 and one in 2017, enabling key findings to feed into and complement the work being done in the 5G PPP Security WG. The 2017 Open Consultation revolved around one key question: Security in 5G: where we stand today and what else needs to be done? The consultation was designed for representatives from 5G-related standardisation organisations, 5G industry (including SMEs), business verticals, policy makers and regulators, relevant industry associations and users of future communication networks. Its main goals were to identify security aspects not yet addressed or only partially covered, barriers to progress on priority issues and how not tackling them in time might affect 5G adoption. The consultations have also been a driver for complementing industry perspectives on 5G security with views from other key stakeholders, such as policy makers, regulators and research. – The need for end-to-end security. – There is consensus among industry and vertical representatives about several design principles emerging from the work in 5G PPP Security WG. Further debate and assessment would be a valuable contribution towards increasing consensus and/or possible other approaches. – Inputs related to 5G PPP contributions are clearly only relevant to respondents familiar with the programme. However, those respondents involved in the programme believe that anticipating security issues and research results has helped to influence 5G standardisation to some extent. There is consensus that standardisation and compliance with standards is key to widespread adoption. – Risks associated with innovative technologies point to possible delays in adoption. 5G is no exception. Similar viewpoints emerging from industry, verticals and 5G-related organisations. Increased exposure to cyber threats is also highly relevant. A key point emerging from the verticals is the lack of coherent regulations and policies for industry applications. – Trust is another aspect of 5G that requires further investigation. 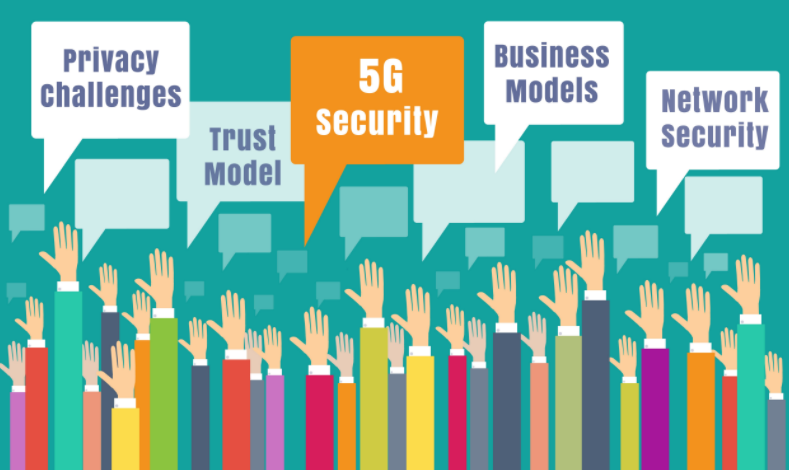 Trust and liability model between the different stakeholders is the first step towards the widespread adoption of 5G, especially for vertical services. An emerging priority for regulatory bodies emerging from the survey is the introduction of new responsibility schemes in terms of distribution and allocation of responsibilities and obligations to address breach of Trust/ security between parties. – One area for regulatory action is greater clarity on responsibilities and liabilities, as well as “access regulation”. In the context of 5G, regulators should seek to create and apply a consistent standard across the entire ecosystem so that the same criteria could be applied when evaluating the benefits and costs of open access mandates, regardless of sector or technology. – Another area for regulatory action is greater clarity on responsibilities and liabilities, as well as “access regulation”. In the context of 5G, regulators should seek to create and apply a consistent standard across the entire ecosystem so that the same criteria could be applied when evaluating the benefits and costs of open access mandates, regardless of sector or technology. • RAN sharing: Intra-RAT radio resource management control app demonstrates the benefit of control plane programmability based on the COHERENT SDK to dynamically partition resources among multiple tenants/slices based on their service descriptor and their predicted short-term performance. o Inter-RAT traffic steering app shows how the traffic of users can be dynamically steered, balanced, and isolated between Wi-Fi and LTE networks based on their actual radio resource utilizations. o Inter-RAT spectrum management app: demonstrates how the knowledge base maintaining the information related to operators and shared spectrums, policies, and interference are stored, managed and shared across different RAT, namely LTE and Wi-Fi. information is retrieved and analyzed through the COHERENT SDK to find and reallocate the best available frequency, bandwidth, and power to a subset of cells that opportunistically make use of such spectrum to improve both users and network performance. The SELFNET framework helps operators build a resilient network infrastructure for 5G, which makes the most effective use of the network technologies they already have. The SELFNET framework enables service providers to significantly reduce the time for service creation, depending on the conditions down to about 10 minutes. The SELFNET framework can help network operators significantly reduce the total cost of ownership for their network infrastructures. The next MWC will be again a major promotion opportunity for 5G PPP projects. 5G-IA and 5G PPP participation are on going. A stand has been booked in Hall 7. Videos from 5G PPP projects will be displayed; paper brochures will also be available there. Four 5G PPP Projects will have demos/videos : 5GCAR, 5GXHaul, 5GMoNarch and ONE5G, respectively at the MWCapital booth and at the Conference session on « 5G & IoT use cases ». More information disclosed later as the organisation progresses. 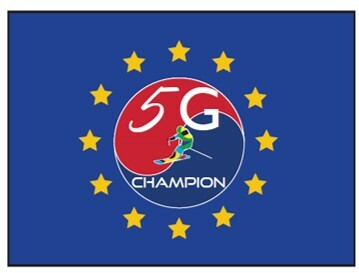 If you are a 5G PPP project wishing to participate/help, do not hesitate to contact Jacques Magen (To-Euro-5G/InterInnov), jmagen@interinnov.eu. or Alessandro Bedeschi (5G-IA), alessandro.bedeschi@5g-ppp.eu. The 2018 edition of this conference will be held in Barcelona on April 15-18, 2018 at the Barcelona International Convention Centre (CCIB) and will be organized by the Centre Tecnològic de Telecomunicacions de Catalunya (CTTC). WCNC’18 is seen as a major dissemination opportunity for 5G PPP phase 2 projects. Three phase 2 projects will be present @WCNC’18. One5G and 5G-Xcast are co-organizing a joint workshop on cm-wave and mm-wave based communications for 5G Networks (CmMmW5G). 5G-TRANSFORMER co-organises the First Workshop of COntrol and Management of network slices for VERTicals (COMVERT). 5G-CORAL as complementary 5G project will also be there. It co-organises the First International Workshop on Edge and Fog Systems for 5G & Beyond (IWEF). At last, the 5G-Miedge, TWEETHER and ULTRAWAVE projects organise a Special Session Workshop on “Economics and Adoption of Millimeter Wave Technology in Future Networks”. As stated by Chris Pearson, President of 5G Americas in Seoul late November 2017 (4th Global 5G Event), the next Global 5G Event will be organised by 5G Americas in Austin, TX, on May 16th and 17th. The 5G New Horizons Wireless Symposium is co-located with both 5G North America and BCE at the Austin Convention Center. See here for additional information on the Symposium. Organisation on the 5G-IA 5G PPP side will be disclosed later. 5G-MoNArch organises a Workshop on 5G Architecture on May 24th, 2018. View the CfP here. Paper submission deadline is January 3rd, 2018. In this 2018 edition, a particular emphasis to edge cloud, MEC and vertical segments will be given, due to the growing interest of these topics toward 5G networks. The ONE5G project focuses on boosting the capacity of mobile networks, improving their energy efficiency and enabling a variety of new vertical use cases in dense urban areas as well as in rural environments. ONE5G has received eight million Euros in funding from the European Commission under the EU’s “Horizon 2020” initiative to drive research that enables a swift move towards 5G NR and advance digitization. The 5G CHAMPION “5G Communication with a Heterogeneous, Agile Mobile network in the PyeongChang Winter Olympic competition” Project develops key enabling technologies for a proof-of-concept environment to be showcased at the 2018 Winter Olympics in PyeongChang, Korea. This will allow maximum visibility for the available technology two years ahead of 2020, i.e. the official launch of 5G. 5G-CHAMPION is led by CEA-LETI on the EU side and by ETRI on the South Korean side. Several workshops focusing on 5G. Several 5G PPP projects involved. • 5G New Radio: novel techniques in modulation, coding and waveform. • Beamforming and massive MIMO. • 5G Radio Access Network design. • 5G Core Network design. • Network Slicing for dynamically adaptable 5G networks. • Proof-of-concepts, prototypes and demonstrations for 5G. • Technology advancements for specific verticals such as M&E, IoT or automotive. Moreover, the conference will hold specific workshops organized by one Phase 1 project (5G-Ex) and several 5G PPP Phase 2 projects: 5G-Ex (“Control and Management of Vertical Slicing including the Edge and Fog Systems” ), 5G-Xcast (“Point-to-Multipoint as Key Technology Element for 5G Systems”), IoRL (“A Scalable and License Free 5G Internet of Radio Light Architecture for Services in Homes and Businesses”) 5G-Transformer (“Control and Management of Vertical Slicing including the Edge and Fog Systems” with 5G-CORAL and 5G-Ex), Bluespace (“5G Infrastructure: Requirements and Enablers from Broadcasting and Multimedia Applications”), NGPaaS (“Accelerating Microservices: Design and Development” ) and 5G-MEDIA (“Media delivery innovations using flexible network models in 5G”). 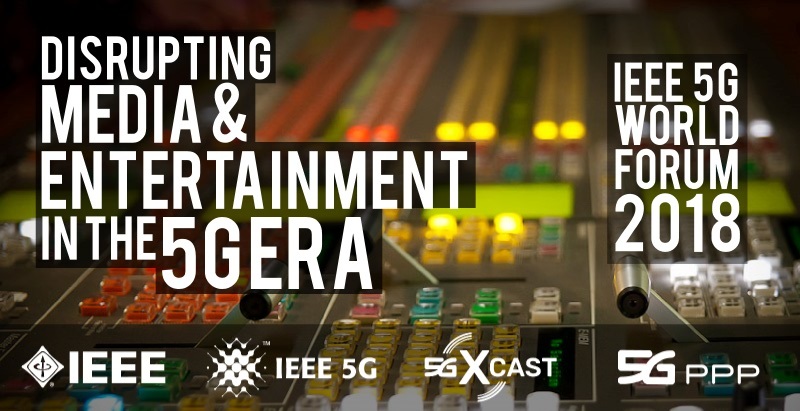 Special session during the IEEE 5G World Forum on “Disrupting Media and Entertainment in the 5G Era” organised and co-sponsored by 5G-XCast. SPEED-5G project sponsors a workshop on Advanced Spectrum Management in 5G+ Networks. Addressed to both industry and academia, it reports interesting novel results of international research projects on some selected aspects of 5G and beyond networks with main focus on dynamic spectrum access techniques. Attendees will have the opportunity to listen to technical presentations in the lecture room, as well as to witness live demonstrations of some key results, in dedicated adjacent small rooms. From 10:00 till 17:00 in dedicated rooms live demonstrations will be available for interested participants, running in parallel to the presentations held in the lecture room. Attendance is open to the public, but is subject to a previous free registration via the Registration Form. Due to the limited room capacity, acceptance is based on a first come-first served base. More info and online registration here!